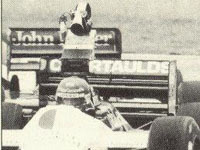 Another pioneering camera car, like that of François Hesnault in 1983 - just to show how far on-car camera technology has come in a couple of decades. But judging by this picture and that of Hesnault's the racecam wizards of the eighties made a large step backwards! Philippe Streiff was a talented driver who has shown a fair amount of pace in every category he contested. He came up through the ranks with the little French AGS team after having won the 1981 French F3 Championship in a Motul Nogaro Martini-Alfa. His two AGS years in F2 and F3000 were mixed with several F1 opportunities. A third Renault entry at the final GP of 1984 at Estoril marked the start of his F1 career. At the end of the following season he was as a replacement to crash-happy Andrea De Cesaris, immediately impressing with a 5th grid position in the European GP Nigel Mansell won and scoring an unexpected podium in Australia, crossing the line with a wrecked front-end after hitting second-placed team mate Laffite two laps from the end! After a one-off for Tyrrell at Kyalami in 1985 (which was boycotted by Ligier), he joined Ken's team for a full season in 1986. Tyrrell's association with Renault was not a happy one, however, Philippe and team mate Martin Brundle suffering from Renault's lack of customer effort after its works withdrawal at the end of 1985. For 1987 Tyrrell turned to Ford engines and Jonathan Palmer, but while he helped the team win the Atmo Cup overall results were still short of happening. With Palmer's better performances effectively having destroyed Streiff's chances of a top-line drive, Philippe returned to his old home at AGS. Equipped with a neat and uncomplicated package a rejuvenated Streiff turned the hitherto underperforming Gonfaron team into a solid midfielder before being lost to the F1 world by a horrid test accident at the start of 1989. The crash left him paralyzed from the waist down. Today, Streiff is best known as the organizer of the annual Elf Kart Masters at Bercy.